The new Consumables Price File is now available! We have 2 versions available for you! One of which is suitable for iPad users and the other version for PC users. iPad version:- As the iPad cannot use the drop down arrows we have re-worked the price file to follow in color order to the catalogue, Parts are easy to find as they are displayed alphabetically. PC Version:- This is quick and simple to use as the drop down arrows will allow you chose from the Category Header which section you wish to look at. This has been color coded to the catalogue and the entire price file is displayed alphabetically. Please call 01268 756 216 to request yours or alternatively email jnc@pearl-automotive.co.uk to make your request. For those of you that have already requested a Price File we are currently in the process of sending them out and you will receive it this week. We would like to Thank-you for your patience however we hope you would agree; it was worth the wait! DOWNLOAD OUR CONSUMABLES CATALOGUE TO YOUR IPAD OR TABLET ! The interactive Catalogue is suitable for PC, Tablet and iPad users. If you are an iPad user you are able to download and save it into the iBooks app! We have designed it so it allows you to search the pages of interest at a click of a button, rather than going back and forth between pages. On the Front cover you will see icons like Click on it to take you to that section within the catalogue. Once in that section if you see an icon like Click on it to take you to that page. On the bottom of each page you will see a Return to Main Menu option, click on this to take you back to the main menu. Click the Link below which will take you to our website to download! NEW CONSUMABES PRICE FILE AVAILABLE NEXT WEEK! -2,500 + CONSUMABLE PRODUCTS IN CATALOGUE. If you haven’t already requested your copy of the new Consumable Price File please email; jnc@pearl-automotive.co.uk with your request and you will be added to the list to receive the updated Price file once it has become available. 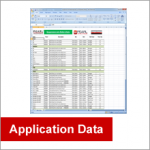 Product Application Data now available! Please be advised that all of our product application data is now available via the website, just go to the Products Info tab and select the Application Data option on the drop down box to sign in. Please note; for registered users only. Alternatively please click here to go straight to there! Pearl Automotive are now on Twitter! Click on the Image and Follow us for all the latest News, Promotions and Special offers! Remember to keep an eye out for our Promotion codes which are coming soon, exclusive to our twitter followers! NOW AVAILABLE, NEW CONSUMABLES CATALOGUE! Request your copy now which is available in A5 and A4 versions. To download the interactive version of the catalogue which is suitable for PC and iPad users, please go to the Catalogues / PDF downloads section of the website. Alternatively, if you haven’t signed up please go to the marketing section and sign up for FREE in order to gain access to the Latest Promotions; Special Offers and News Pearl Automotive have to offer! If you are already signed up and have forgotten Login details, please email jnc@pearl-automotive.co.uk or alternatively follow the ‘forgot your password’ link. New Workshop Consumables Catalogue Coming Soon!! We are pleased to announce that our NEW consumables catalogue will be available soon. To preorder your copy, please go the catalogue section of the website.